Our Mission: To help you craft commercial-quality wines and craft beer at non-commercial pricing! 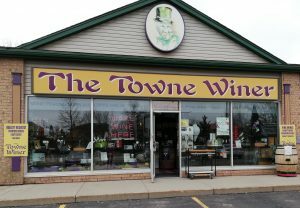 The Towne Winer opened in 2003 in the south- end of Guelph at the Downey Road Plaza. The proprietors both have their own areas of expertise: Barrie (a.k.a. 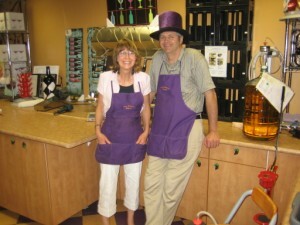 The Winer) started to vint wine 40 years ago while Liz has over 30 years experience in retail. Our international, multi-award winning winemaker sources the world’s best wine kits, pasteurized juices, fresh varietal juices and musts from Italy, California, South America, Australasia and, of course, Niagara & B.C. for you. We also have an extensive French oak barrel program to age your wines plus specialize in vinting all our varietals and French hybrids with “skins on” for more complexity/age worthiness. And with the expertise of our winemaker, we vint commercial quality, age-worthy wines for you to enjoy and share. Our micro-winery offers an inviting atmosphere in which to vint your quality wines. Focussing on proven wine accessories and essentials, particularly wine decanters and aerators to enhance your wine drinking experience. 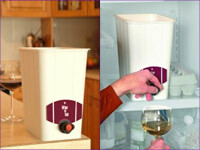 Also, we offer supplies and related wine and beer making equipment for the home wine-maker/ brewer. Our goal is to create maximum value and quality in every price point/kit/juice category for you. 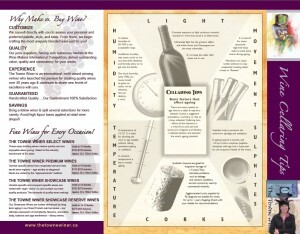 The results of quality wine making are that you will enjoy wines of more complexity, taste, finish and body. We stand behind this goal and our mission: providing you value & quality with your wining experience with us. As with our wine programme, we strive to give you a true Craft Beer experience. 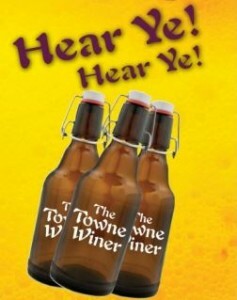 The Towne Winer has launched a naturally carbonated, unfiltered, premium, handcrafted small batch beer programme locally sourced and developed by our highly experienced Munich trained brew-master. It is an innovative and exciting concept which offers interesting craft beer varieties and seasonal specialties. Bottling is done in recyclable 750ml. glass Belgium bombers that are “swing-tops” or crown capped. All Towne Winer beers are made with 100% all-natural ingredients with minimal processing and are not pasteurized nor chemically preserved. These cask conditioned lagers and ales can even become more complex and smoother with several months of ageing with proper storage conditions. 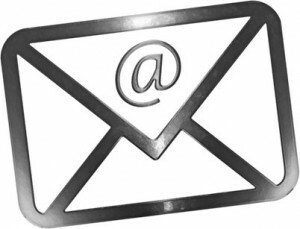 We are NOT a franchise organization, but offer fee-based consulting services in all aspects of starting your own on-premises wine making business. We have 30+ years experience and can provide ongoing support for as long as you feel it is necessary. If you are interested in owning and operating such a lifestyle business and would like more information please contact us by emailing info@thetownewiner.ca or call (519) 824-9191. Hear Ye! Hear Ye! 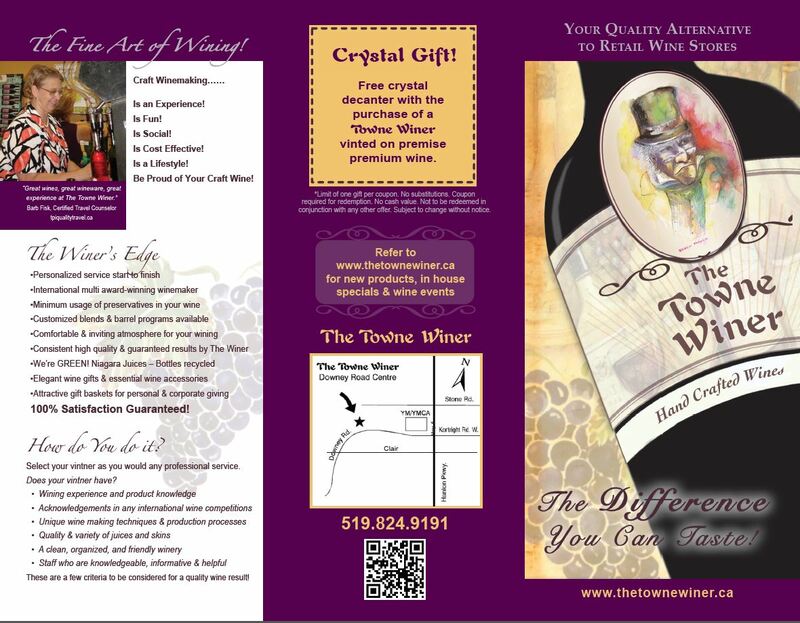 The Towne Winer has been voted Diamond in the Make Your Own Wine/ Beer Platinum level by the Reader's in the 2018 Guelph Tribune Readers' choice awards. Thank you to our supporters! 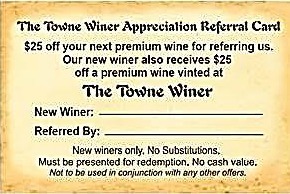 Mention this award for $10 off your next wine in appreciation from us! Hear-Ye! Hear-Ye! 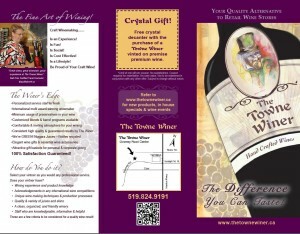 New Wine Makers! Reduces Bottling! Join millions of people around the world making a statement about climate change, eco-oenophiles can now use the new era of premium Bag-in-Box (BIB) wine–on–tap systems. Hear Ye! Hear Ye! 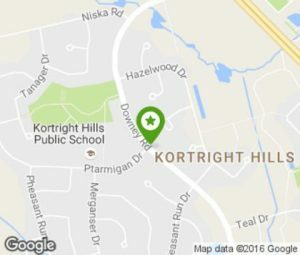 Craft beer brewed here! 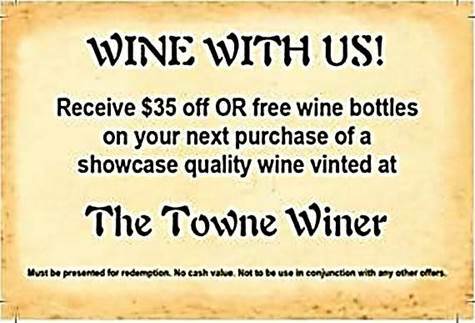 The Towne Winer has launched a premium handcrafted, small batch beer programme that is naturally carbonated, unfiltered and locally sourced. Developed by our highly experienced Muncich- trained brewmaster, we are excited to offer you this quality product.